Have you ever built up a city in SimCity, only to have more fun trashing it with natural disasters? If so, you may want to check out Elements of Destruction for the Nintendo DS. 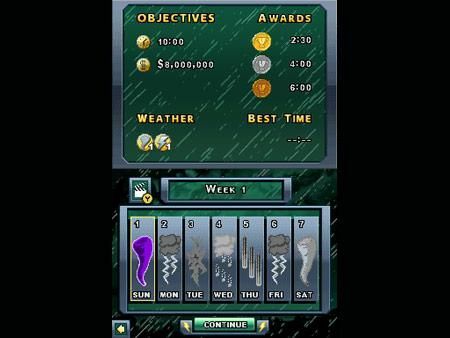 In this budget-priced mayhem simulator, you use the touch screen to unleash tornadoes, storms, and other calamities on pre-fabricated cities and try to dish out as much destruction as you can before the clock runs out. Creating disasters and moving them around with the touch-screen is both easy and fun. Homes, skyscrapers, and stadiums catch fire and crumble as you drag tornadoes back-and-forth over them. In a vain effort to stop you, the government has placed huge machines throughout the city that can cancel out the weather phenomena you create. They've also dispatched repair planes to fix the buildings you damage. Each mission puts more and more of those hurdles up against you, but don't worry, you earn mightier storms with every new level you open. Power-up items on the map can also increase your disasters to near-Biblical proportions. Some missions totally let you run wild, while others will have you constantly restarting in order to figure out how to crack the city's defenses within the time limit. The only major problem is that competing against faceless repair planes and the clock gets old pretty quick. You can stave off boredom by playing in shorts bursts. Or, you can convince your friends to buy the game and take advantage of the local multiplayer mode, which offers rousing tug of war style matches where the buildings you destroy end up on the other players' screens. Description A twisted disaster sim that you'll play for a few minutes here and there whenever you get the urge to destroy the world.